This 3R MNPV6 DISCO combiner is one in a series of disconnecting PV combiners from MidNite Solar. This model holds up to 6 poles of our common MNEPV and or MNEAC CBI breaker. This model will support several different configurations. 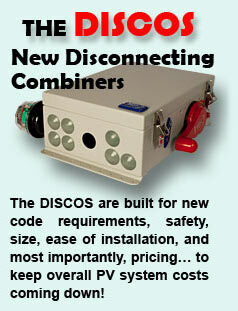 This 3R MNPV6-250 DISCO combiner is one in a series of disconnecting PV combiners from MidNite Solar. This model includes the buss-bar to use up to 3 of our 300 volt DC breakers as a 3 string DC combiner. This 3R enclosure includes 2 busbars. Can use up to 3 of our 240 VAC breakers to combine up to 3 strings of 240 volt micro inverters. MNPV4HV-DISCO 3R-BSC Disconnecting Combiner has 80 amp busbars, 100 amp load break rated switch has two poles in series. Deluxe Disconnecting Combiner has 80 amp busbars, 100 amp load break rated switch and a third pole which is the feedback micro switch. MNPV6HV-DISCO 4X PV Disconnecting Combiner, 3 poles, 125 amp busbars, 100 amp load break rated switch. MNPV8HV-DISCO 3R PV Disconnecting Combiner, 5 poles, 80 or 160 amp busbars depending on how they are configured. 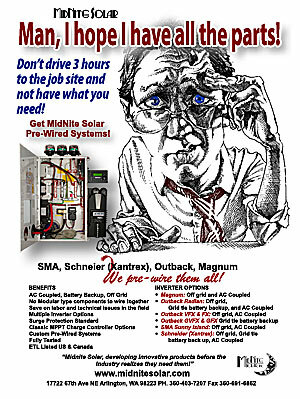 Switch is a 100 amp load break rated or 175 amps load break rated depending on configuration. MNPV8HV Disco 4X PV Disconnecting Combiner, 5 poles, 80 or 160 amp busbars depending on how they are configured. Switch is 100 amp load break rated or 175 amps depending on configuration. MNPV16HV DISCO 4X PV Disconnecting Combiner, 5 poles, 100 amp load break rated or 175 amps load break rated for busbars and switch. The MNPV8HV-DLTL 3R was specifically designed for the new dual channel MPPT on transformer-less inverters. The MNPV8HV-DLTL 4X was specifically designed for the new dual channel MPPT on the transformer-less inverters. The MNPVHV16-DLTL-4X was specifically designed for the new dual channel MPPT on the transformer-less inverters. MNSOB3R-2P is a disconnect switch. It has a 2 channel switch that breaks both the positive and negative of a PV string to a Transformer-less inverter. MNSOB3R-4P is a Disconnect switch. It has a 4 channel switch that breaks both the positive and negative of two isolated PV strings to a Transformer-less inverter. MNSOB4X-2P is a Disconnect switch. It has a 2 channel switch that breaks both the positive and negative of a PV string to a Transformer-less inverter. MNSOB4X-4P is a Disconnect switch. It has a 4 channel switch that breaks both the positive and negative of two isolated PV strings to a Transformer-less inverter.